The University unveiled its new start-up incubator at the grand opening of the Chicago Innovation Exchange (CIE) at Harper Court. Speakers at the event included President Robert Zimmer, Governor Pat Quinn, Senator Mark Kirk, and Mayor Rahm Emanuel. Quinn announced at the opening that he will invest $1 million into the CIE to promote new businesses and job growth in the technology and innovation sectors across Illinois. “This investment will pay dividends for our state by giving students, faculty, and local community entrepreneurs the opportunity to grow in Illinois. While we have more work to do, Illinois is making a comeback, and it couldn’t happen without the creative and motivated start-ups that are taking root right here at the Innovation Exchange,” Quinn said. In an interview, CIE Director John Flavin emphasized the opportunities available at the University that the CIE complements. 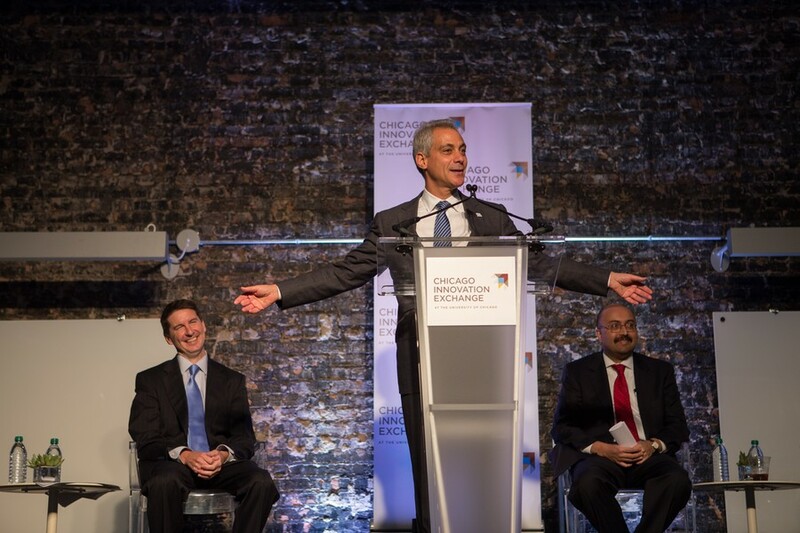 “[The] motivating factor for opening up the Chicago Innovation Exchange was to bring the success of the [Booth School’s] Polsky Center [for Entrepreneurship and Innovation] across campus, so not only to the business school but connecting it to the other great things that are happening in the innovation landscape,” he said. The space, which was funded by the University, comprises a total of 32,000 square feet divided among three buildings. The central CIE hub is located on the second floor of the Harper Theater complex and has multiple types of spaces like incubation space for start-up work, classrooms, conference rooms, and a large event space that doubles as a working space. The CIE also has a location on the 11th floor of the new Harper Court tower, dubbed the “CIE Skydeck,” that is designed to provide conference space and host outside speakers. A third location, which will open in the spring of 2015, will become a fabrication lab for making prototypes and will offer 3-D printers, mini-mills, and laser cutters. Flavin emphasized the importance of incubating all the resources needed to grow the ideas of CIE participants. The CIE also has a $20 million Innovation Fund that was raised by outside donors to support new ventures. Start-ups must go through a selective process in which they must demonstrate a proof of concept, or that their idea will work. Ventures that are funded will get investments that range from $50,000 to $200,000. More than 100 companies have applied, and the CIE anticipates incubating 20–30 companies at a time once the third location opens. To encourage students to visit the CIE, a new CIE shuttle route was created that goes to and from campus every 30 minutes from 7 a.m. to 6 p.m. In addition to workshops and events by outside speakers that are available to any University of Chicago student, the CIE also offers membership, which is free for students for this academic year. As members, students can access working space, conference and meeting rooms, and attend mentor office hours.